Home › Christian Life › What’s Better? Your Who or Your Do? Jen’s Gem: God’s love is unconditional. Over the past year, my daughter and I have been immersed in the college application and selection process. We began pursuing colleges specializing in fashion merchandising. However, not long ago, she accepted an offer at a well-known university and her course of study? Criminal Justice and Investigative Services. Whoa! How we got from a potential career in fashion to one that focuses on math, science, and potentially technology is pretty interesting. Suffice it to say, my daughter recognized that while she had a passion for shopping (earning her own money can do that! ), her strengths and talents were elsewhere. The application process was time-consuming but truly it was not difficult. With nearly everything being online, it was a matter of checking this box or that, attaching transcripts, letters of recommendation, and of course, the college essay. That process is a whole other blog post! She was accepted at every college she applied to and each gave her a sizable scholarship. When she narrowed it down to her top two choices, I did my best to negotiate for additional monies. These two schools are private institutions and I’ll just leave the four-year tuition bill to your imagination. 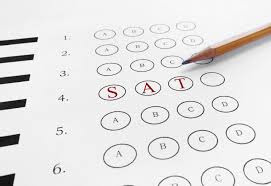 One school noted that she might want to retake the SAT to raise her score. My counter-argument was that a test score does not give an accurate picture of how a student will perform. I pointed out that my daughter had maintained a GPA of above 4.0 throughout high school and her course load was nothing to sneeze at. Sadly, I was not successful in securing more money for her. Turns out, this school and others were focused more on her “Do” than her “Who.” Grades plus test scores equal more money. We live in a society that doesn’t think much differently than the college my daughter will attend. Grand titles, accomplishments, and accolades fuel our judgments of others. Busyness and to-do lists reign supreme. The busier someone is, the more important they must be. I no longer have fancy corporate titles after my name. There was a time when I was so hyper-focused on moving up the corporate ladder that I believed in my guts that my worth and value were tied to a vice president title and the accompanying salary and perks. Neither that title nor my seniority prevented my layoff (nor the hundreds of other VPs) that fateful day in 2009. During my corporate tenure, I would be filled with pride to introduce myself as “Vice President of….” When I saw people’s eyes grow wide, it fueled my ego even more. However, what I find fascinating is today when I tell people that I am a freelance writer, their eyes grow just as wide. It’s not the title, but it’s what I can do to help them in their business. In Acts 10:34, the apostle Peter speaks about how God views titles when he says, “I see very clearly that God shows no favoritism.”(NLT) Another translation says “God is no respecter of persons.” God is not impressed with titles or resumes or test scores. He loves us whether we’re in the mail room or the boardroom. Isn’t that amazing? If I never accomplish another feat for the rest of my life, God’s love for me would remain as it is today. In fact, if I fail at every single thing I try, He will still love me. I don’t have to do a thing to earn His love. It’s a given. It’s free. I don’t have to prove myself with letters of recommendation or take a test or have someone talk to Him on my behalf. Knowing this truth is life-changing. Knowing that no matter what I do, God loves my “who” more than my “do.” He sees my heart, not my LinkedIn profile. He sees my actions, not my accolades. He sees my hunger for a deeper relationship with Him, not my hunger for recognition and fancy titles. All I have to do is believe this – but not in my head like a fact, but in my heart and in my guts. This my friend, has been the life-changing message that enabled me to get back on the horse after two job layoffs, the closure of my baby gift business, depleted bank accounts, the loss of my parents, and a myriad of other challenges that have weaved their way into my life. This week, I’d like to encourage you to meditate on the above Scripture. Speak it out loud. Get God’s love for you into your guts and know that no matter what you do, your “who” is loved with an everlasting love. ‹ Are You Feeling Lucky?